The Garden with Insight garden simulator is an educational simulation that uses weather, soil, and plant growth models to simulate a simple garden in an open-ended micro-world setting. You can plant vegetables and grow them to learn more about plants, the soil, the weather, gardening, and science. 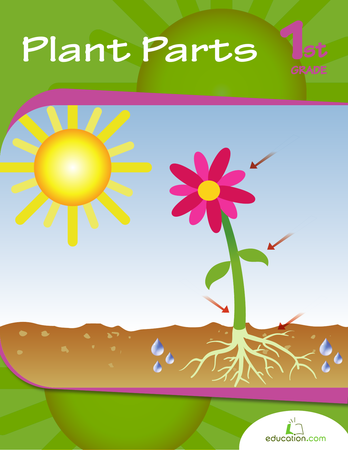 Informative site about how plants grow and disperse. Help unlock the amazing mysteries of plant life. Webquest to find information about plants. Find out what really goes on under the ground. Fill in the correct words in a story about plant reproduction. Several printouts including "label me" sheets to identify the parts for a flower and plant. This Venn diagram compares flowering and non-flowering plants. Go to Kinderart and do a search for plants. You get many great ideas. Children will observe the different shapes, sizes, and vein patterns of leaves as they make fingerpaint leaf prints. In this activity children will learn about some of the different colors flowers can be. Interactive guide to the parts of a flower. Several slides introducing the parts of a flower and their functions. Links to several powerpoint presentations dealing with flowers. What a great resource! Part of a study on states, this page has a picture to color of every state flower. 30 pictures for flowers to print out and color. Cut out flower parts and paste on a plank piece of paper to label. Great site with a lot of pictures of wildflowers to color. Lots of flowers to print and color. Great site. Just type in flowers in the search box and you have plenty to choose from. Go to Kinderart and do a search for flowers. You get many great ideas. From your About.com guide, make this cute potted plant from candy and popsicle sticks! From your About.com guide, create a fun toy using a cd, paper plate, and a sock! Make this flower craft using cupcake liners. Instructions for making an Easter lily using a handprint. Make huge tissue paper flowers! Belinda Bates explains how to create unique flowers using sea shells. From your About.com guide to Senior Living. Donna explains how to make flowers using fabric scraps and pipe cleaners. From your About.com guide to Senior Living. Donna gives ideas for making a flower using hand prints. From your About.com guide, create flowers with curled petals using a styrofoam cup.